There are, principally two kinds of electric guitarists who are likely to be encountered in a survey of the music scene today: The first is the kind who aims his bolts right between the eyes, stunning the listener with electrifying pyro techniques. And then there’s the other, who fires musical missives at the heart, there to make the blood bubble and boil and create an inebriating experience of the music at hand. 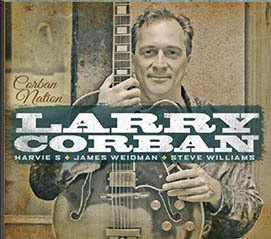 Larry Corban is the latter kind; a guitarist imbued with a soulful sound that comes from a hype-free musicianship that is built on the sound principal of less-flash and more-art. As a result, Corban’s music eschews funny time-signatures, sticking, instead, to hard and inviting swing. And yet, sparks can fly with a quiet, consuming fire fueled by a lot of passion about where there is to go. These wonderful characteristics coalesce right across the musical spectrum of Corban Nation, a joyous disc – the third CD that the guitarist has recorded with the “Aperturistic Trio”. The unusual, ‘found’ word that Larry Corban uses to describe the music he makes with pianist and organist James Weidman, drummer Steve Williams and bassist and producer Harvie S comes from an invented disambiguation of the term ‘aperture’, that device that lets in the exact amount of light into a camera to take the perfect picture. Corban would do well to patent the term for it informs the precise amount of musicianly sizzle that has gone into making this music truly memorable. At any rate, virtually no other musician is likely to have produced the faultless intonation of Corban, evoking warmth and sustained emotion merely by caressing the guitar strings as can be heard on Corban Nation. For the record, the augmentation of the trio on three charts by the glorious and colourful arpeggiated chord-laying of the saxophonist Steve Slagle creates a classy collaboration on “In-Vision,” “Corban Nation” (the track) and “Slow Fizz.” Throughout, though, it is Corban’s excellent ear for sound that provides music that the other musicians delight in, following to an anything-but-inevitable conclusion. The multiplicity of new paths that Corban and Weidman seem continually to be embarking on are exemplified in “Segment,” which takes flight from the sensibilities derived from the poetic assemblage of Charlie Parker. The music is rich with the imagination of a guitarist, ably assisted by the bassist Harvie S, a warrior of many memorable musical expeditions. The presence of Steve Williams, a ubiquitous figure in the late Shirley Horn’s band, is deeply felt and informed by a visceral excitement that is deeply felt in a uniquely blue Jazz manner. Listening to Corban Nation, a slowly burning disc albeit with brightly glowing embers reveals new dimensions to the sonic miracles that a group fronted by an unassuming, elegant guitarist can produce. Corban’s often intimate monologues are bounced off the three other musicians who each have a more extrovert frame of mind and play with a galvanizing commitment. As a result there is a constant feeling of exciting exchanges between musicians with dramatically different personalities. This has enabled Larry Corban to reach a new high point in his recorded output with Corban Nation. Be the first to comment on "Larry Corban | Corban Nation"